After yesterday’s race, I put my head into gear for thinking about what to do during the rest of this month. A lot of my considerations come from the fact that I don’t know what races I’ll be doing anytime soon (unless it’s a half-marathon in December). Since I am going away to Hamburg and entering a different university system in a different country, I don’t know what to be prepared for in regards to being involved with sports. Do they have a running club that helps fund my races in the city? Will I find some races to do there? Will I find the time to run consistently there? Ah! Kidding about the last one. Unless I’m injured, I’m always a consistent runner. What I can’t be sure about is whether I would rather play soccer every evening and whether I’ll try to weather the unusual (for me) cold and winter rain or just hop on a treadmill. These considerations aside, I know that I need to back off a lot on my blogging about running. I’ve been using this as an outlet to feel productive, when in reality I’m procrastinating on preparing for my MA oral comprehensive exam (and packing!). I also lost more time than necessary in preparing for yesterday’s race. While I want to continue running, I don’t need to run to the extent that I was… not that it was terribly much. And I can do less writing about it and move it to the back of the line as far as priorities go. I should be blogging more on my reading blog. So this post is a way to plan what I’ll be doing for the next month so that I don’t have to think about it (or blog about it) anymore. 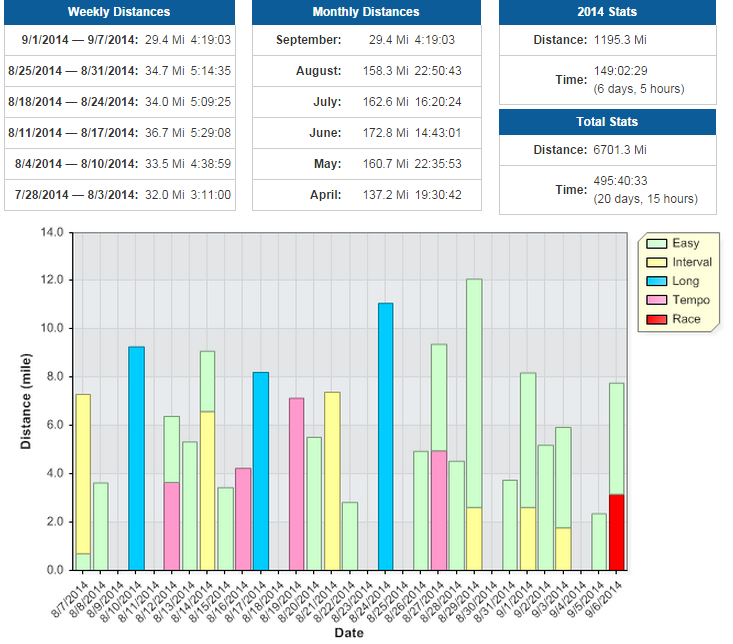 I haven’t really been doing high mileage weeks since my last injury (ITBS) a year ago. Then, I was doing 55-60 mpw that, compounded by some foolish timing of certain workouts, led to injury. However, now that my 5K ambition has been appeased for now, my ambitious self wants to consider training for a marathon again, and to do that I need to build a super-solid base. Now is a good time for it, because it means I have to do less fancy training and just worry about getting mileage in. The past two marathons I wanted to run were waylaid by injuries brought on by increasing distances too soon and intensity too fast. This time, I want to be patient and smart and just start building up my mileage each week with a drop (15-20% less of mileage) every fourth week. The best way to do this, I think, is to just go out and run 5.something miles each day, have a long run on the weekend and let that run make up the distance I need to be able to complete the mileage for the week. Sunday will be rest day. I’ll do weight-lifting every other day to get my core and arm muscles back into shape for longer distances–and everything that MYABR! September 29-Oct. 4: whatever I accomplish in my crazy week of exams and first days abroad! I’m going to return to my old habits of running in the morning and getting the run over with. That way I can use the rest of the day to study, something I desperately need to do. So, if you don’t see me for a while, don’t worry. I’ll be back- especially to post about how running around Hamburg will be!